Difference between revisions of "Mennonite Encyclopedia, The"
The <em>Encyclopedia's </em>continuing editor, [[Bender, Harold Stauffer (1897-1962)|Harold S. Bender]], and associate editor, [[Krahn, Cornelius (1902-1990)|Cornelius Krahn]], wanted to stimulate young adults to pursue Anabaptist and Mennonite studies and sought to share contemporary research with a wide circle of non-Mennonite church historians and theologians. They included articles of the following types: doctrinal, denominational, institutional, ecclesiastical, biographical, and cultural. They also included articles on publications and on family and place names. Less than one-sixth of the completed work contained translated <em>Lexikon </em>material. Editors Bender and Krahn researched and wrote many of the major articles. The historical perspectives of the two men differed markedly; however, they retained their cooperative partnership. Bender supervised scholarship pertaining to the South German and Swiss Anabaptists and Mennonites, while Krahn assumed responsibility for topics related to the Dutch, Prussian, and Russian streams of Mennonite history. [[Zijpp, Nanne van der (1900-1965)|Nanne van der Zijpp]] of The [[Netherlands|Netherlands]] also contributed substantially. Managing editor Melvin Gingerich and translator [[Bender, Elizabeth Horsch (1895-1988)|Elizabeth Horsch Bender]] provided valuable editorial assistance. Editors Bender and Krahn researched and wrote many of the major articles. The historical perspectives of the two men differed markedly; however, they retained their cooperative partnership. Bender supervised scholarship pertaining to the South German and Swiss Anabaptists and Mennonites, while Krahn assumed responsibility for topics related to the Dutch, Prussian, and Russian streams of Mennonite history. [[Zijpp, Nanne van der (1900-1965)|Nanne van der Zijpp]] of The [[Netherlands|Netherlands]] also contributed substantially. Managing editor [[Gingerich, Melvin (1902-1975)|Melvin Gingerich]] and translator [[Bender, Elizabeth Horsch (1895-1988)|Elizabeth Horsch Bender]] provided valuable editorial assistance. During the following 30 years, researchers noted various weaknesses of the <em>Encyclopedia. </em>Some pointed to unevenness in the quality of writing and lamented the dominance of European and North American subjects. Others cited the dated quality of some articles. Still others emphasized the inadequate coverage of theological issues. In 1978, Mennonite scholars from around the world laid plans for a supplemental fifth volume, which was published in 1990. Volume V included updates on materials in the first four volumes plus nearly 1,000 new articles edited by Cornelius J. Dyck and Dennis D. Martin. The content of the five volumes, in modified or updated form, is included in the <em>Global Anabaptist Mennonite Encyclopedia Online</em>, also sponsored by an inter-Mennonite group of organizations. 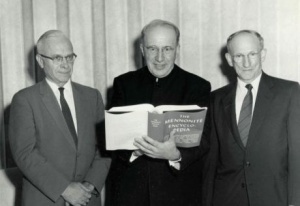 Celebration of the Mennonite Encyclopedia, 4th Volume, August 11, 1959: Left to right: Cornelius Krahn, Harold S. Bender, Melvin Gingerich. Source: H.S. Bender Photographs. HM4-083.Mennonite Church USA Archives - Goshen. Goshen, Indiana. 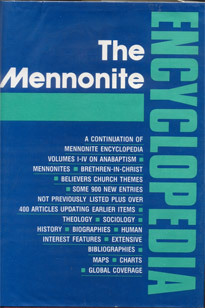 The Mennonite Encyclopedia published in four volumes from 1955 to 1959 (with a supplemental fifth volume in 1990), is the most accessible and authoritative reference work available on a host of Anabaptist and Mennonite topics. Published jointly by the Mennonite Church, the General Conference Mennonite Church, and the Mennonite Brethren Church, the four-volume set contains maps, illustrations, and 13,688 articles contributed by more than 2,700 writers. In 1945, at a meeting of the Mennonite Research Fellowship in Bluffton, Ohio, historian C. Henry Smith proposed that American Mennonites translate and expand the Mennonitisches Lexikon, a German project that had been nearly halted during World War II. Smith and his colleagues formed a "Lexikon Committee." Three years later, the scholarly effort had grown to include a network of editors and a 50-member council representing 13 Mennonite groups and 6 non-Mennonite denominations. Smith's death in 1948, however, was a blow to the project. The Encyclopedia's continuing editor, Harold S. Bender, and associate editor, Cornelius Krahn, wanted to stimulate young adults to pursue Anabaptist and Mennonite studies and sought to share contemporary research with a wide circle of non-Mennonite church historians and theologians. They included articles of the following types: doctrinal, denominational, institutional, ecclesiastical, biographical, and cultural. They also included articles on publications and on family and place names. Less than one-sixth of the completed work contained translated Lexikon material. Editors Bender and Krahn researched and wrote many of the major articles. The historical perspectives of the two men differed markedly; however, they retained their cooperative partnership. Bender supervised scholarship pertaining to the South German and Swiss Anabaptists and Mennonites, while Krahn assumed responsibility for topics related to the Dutch, Prussian, and Russian streams of Mennonite history. Nanne van der Zijpp of The Netherlands also contributed substantially. Managing editor Melvin Gingerich and translator Elizabeth Horsch Bender provided valuable editorial assistance. During the following 30 years, researchers noted various weaknesses of the Encyclopedia. Some pointed to unevenness in the quality of writing and lamented the dominance of European and North American subjects. Others cited the dated quality of some articles. Still others emphasized the inadequate coverage of theological issues. In 1978, Mennonite scholars from around the world laid plans for a supplemental fifth volume, which was published in 1990. Volume V included updates on materials in the first four volumes plus nearly 1,000 new articles edited by Cornelius J. Dyck and Dennis D. Martin. The content of the five volumes, in modified or updated form, is included in the Global Anabaptist Mennonite Encyclopedia Online, also sponsored by an inter-Mennonite group of organizations. An enduring legacy of the Mennonite Encyclopedia is the sense of denominational pride which guided its editors. Some contemporary scholars suggested that the Encyclopedia enabled Mennonites to establish themselves as a mainline Protestant church body during the post World War II years. Indeed, the publication of this inter-Mennonite reference work became a celebrated moment in the denomination's history. Bender, Harold S. "The Mennonite Encyclopedia: Report of the Editor to the Publishing Committee." Mennonite Quaretrly Review 38 (1964): 361-367. Gingerich, Melvin. "Harold S. Bender and The Mennonite Encyclopedia." Mennonite Quarterly Review 38 (1964): 172-74. Waltner, Rachel. "From Anabaptism to Mennonitism: The Mennonite Encyclopedia as a Historical Document." Mennonite Life 37 (December 1982): 13-19. Files of the Mennonite Encyclopedia are located at the Archives of Mennonite Church USA (Goshen, IN & North Newton, Kansas, USA). Goossen, Rachel Waltner. "Mennonite Encyclopedia, The." Global Anabaptist Mennonite Encyclopedia Online. July 2011. Web. 24 Apr 2019. http://gameo.org/index.php?title=Mennonite_Encyclopedia,_The&oldid=101338. Goossen, Rachel Waltner. (July 2011). Mennonite Encyclopedia, The. Global Anabaptist Mennonite Encyclopedia Online. Retrieved 24 April 2019, from http://gameo.org/index.php?title=Mennonite_Encyclopedia,_The&oldid=101338. Adapted by permission of Herald Press, Harrisonburg, Virginia, from Mennonite Encyclopedia, Vol. 5, p. 571. All rights reserved.